It’s mid-July and the scuds are singing, and I don’t mean scud missiles. I mean katydids of the genus Scudderia, named after Samuel Hubbard Scudder (1837-1911), an early American entomologist. In nearby Connecticut Hill Wildlife Management Area, I’m now hearing the songs of two species: the Broad-winged Bush Katydid (Scudderia pistillata) and the Northern Bush Katydid (Scudderia septentrionalis). It is the latter that excites me most right now because the window of time in which it sings is narrow and it’s always a pleasure to home-in on them when they are at their peak. In my neck of the woods, the Northern Bush Katydid sings from thick shrubs at the edges of clearings. Males start singing at dusk and their rate of singing is highest shortly after dark. When there’s a lot of courtship and mating going on (which there is now at Conn Hill), you will be alerted to their presence by the excited, high-pitched clicks of the male, which are so high-pitched that many people are not able to hear them except up close (most of their energy is around 12,000 Hz!). As the clicks get more excited, the male will break into a series of buzzes lasting several seconds; they too may be difficult for some to hear. Interestingly, calling occurs in waves and appears to be contagious. After a period of quiet lasting a few minutes or longer, one male will begin clicking and others in its vicinity will join in. Soon you’ll hear buzzes erupting and the whole affair builds in intensity … then suddenly all the katydids fall silent. This kind of contagious group singing behavior is not uncommon in the singing insect world. At 0:54, a bird sings. I can’t tell what it is. What bird would sing at 11 PM? I do hear other Bush Katydids responding, which is cool. I hear these things randomly in my backyard. Sometimes they rarely call, other times every night. For the past several weeks the sounds of crickets during the night has almost been deafening here in Ithaca. You literally couldn’t carry on a conversation outside without having to raise your voice. In addition we have been getting some brown colored small-sized crickets in the house. Fortunately they aren’t making any noise, which seems unusual. I remember as a kid having the large black variety show up occasionally in my bedroom and having to find it in the middle of the night (which was nearly impossible) to make it stop chirping. This is the first year I’ve had the pleasure of seeing and hearing Northern Bush Katydids, although I would guess they’ve been in woodland edges all along and I just didn’t hear their soft but elegant song. One of the big differences this year is learning that they come to lights; black lighting for moths can bring the males right in. When “mothing” with my friend Linda Gilbert on her Geauga County, NE Ohio property we had four males at once! A week later I was able to bring one in with a large flashlight propped up on a park bench just inside a wooded area. Yes, this summer we’ve had them landing our front screendoor, and also bedroom windowscreens, attracted to lights within. I heard one singing two nights ago at the edge of a shrubby field very close to where I live. I expect their songs will be hard to come by once August really takes hold. we had some of these when I was out recording last week and this week they’re gone. that buzzing sound sounds like the buzzing sound a titmouse or chickadee makes when upset a bit. wonder how they make those clicks. I think the clicks are made with their wings, as is the buzz. But are the clicks caused by the action of the “file” against the “scraper”, as are most insect songs. I’m not sure, though I imagine this is the case. Maybe my friend Wil can shed light on this. The clickings and buzzings of the North Bush Katydid (Scudderia septentrionalis) usually do subside toward the end of July, at least in my experience here around Ithaca, NY. Another species of Katydid that clicks is the Greater Anglewing, Microcentrum rhombifolium. One of my favorite summer singers. 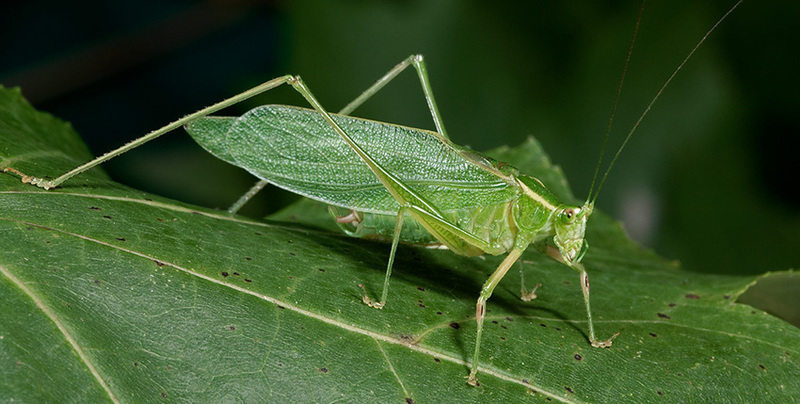 We started to hear the Northern Bush Katydids singing in the woods near the house on June 28! At least 2 weeks earlier than typical. Well, living in the middle of nowhere I can listen to cicadas, birds, crickets, katydids, frogs-you name it, all from my window while on the computer! I was just guessing on the four-spotted–all those tree crickets sound the same to me so I really have no clue. They sing from tall grasses/weeds in the fields in the open leading me to four-spotted. We have been hearing these in western NY for about a week, but last night they were the loudest and most numerous I have heard them in years, singing from our wood edges, garden shrubs and even on our canopy on the deck! The broad-wingeds are also out here, for about 2 weeks. Also I have heard sword-bearing coneheads, four-spotted tree crickets, and last night the first snowy tree cricket of the season! That’s great Nick. I did hear Sword-bearing Coneheads at a different location, plus a tree cricket in downtown Ithaca, trilling away in a shrub. It might have been a Broad-winged Tree Cricket, though I’m not sure. And just down the street, I heard a Northern True Katydid singing from high in a tree. Soon we’ll have lots of Linne’s Cicadas emerging around Ithaca and summer days will be punctuated by their buzzy songs. I’m sure there much more than I’m missing because of spending too much time in front of my computer or else asleep. What’s the remedy for that? Hooray … the insect season has begun! !